A complete but dead-simple accounting solution. One-time and recurring billing so you get paid fast. Full suite of reports and insights to keep you on track. 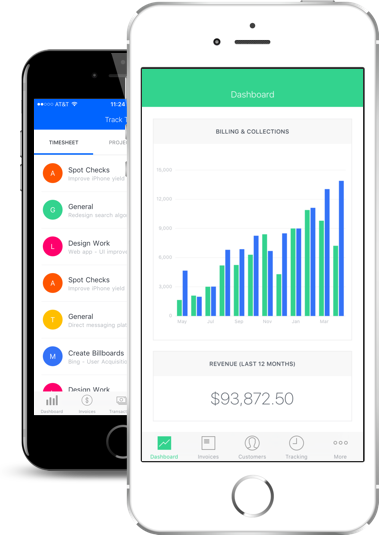 Smart and automated expense tracking. Stop searching for a free Zoho invoice alternative and just sign up for ZipBooks. It’s the accounting software of your dreams, offering unlimited storage for client profiles and a way to send clients clear, professional invoices. True Fact: ZipBooks users spend 15% less time on mundane bookkeeping tasks. It really is possible to get your finances in order in just a few minutes. 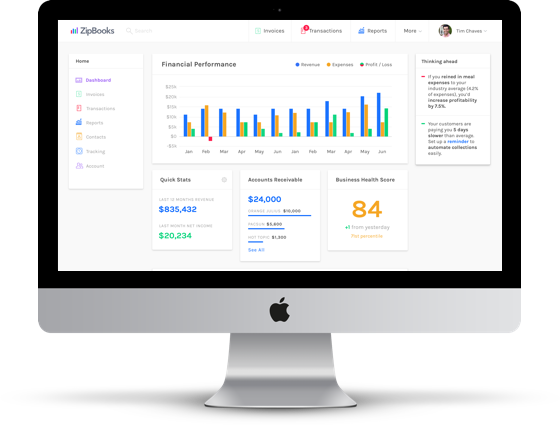 With a simple time tracker, free online invoice examples, and the ability to track expenses and record estimates, ZipBooks makes accounting so much simpler. Because of its simple design, your first day with ZipBooks will be a very productive day. Once you’ve signed into your account, you’ll notice that everything is right where you need it, and you’ll be able to focus on what’s important in order of priority. Try creating a project and recording time you spent on that project. Then pull up our simple invoice template and opt to add unbilled time to that invoice. It’s easy to include recorded project info in an invoice. Your clients will appreciate the transparency, and they’ll thank you by making payments faster. Sending online invoices with ZipBooks accelerates payment by 17.5 days on average. 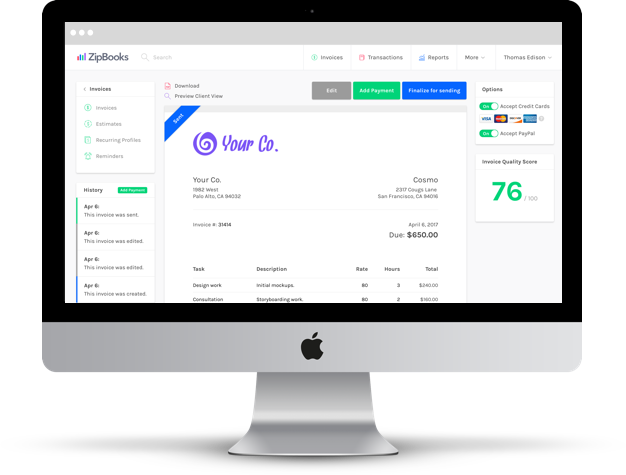 ZipBooks is a free QuickBooks download alternative that allows you to create and send an invoice in seconds. Just log in, create a new invoice, select a client, and opt to add unbilled time to that invoice. When including that time, you’ll have the option to bill by month or by project. This allows you to bill a client for only a certain portion of the time you worked. Or, you can bill for all of the time you have recorded on a project. You don’t need to wait until the end of the day to catch up on paperwork. Feel free to send an invoice while you’re still with a client. Or, begin filling out an invoice when you have a spare minute and save it to send later. It’s never been easier to invoice than with a free ZipBooks account. It’s easy to keep your finances organized when using free accounting software for Mac. ZipBooks allows you to pull up your account from any browser, device, or operating system. So if you start your day in the office and finish your day on the go, you can pull up your data wherever you are. Anywhere-access to your data allows you to keep accurate records without the hassle. When you launch the ZipBooks time tracker, you can start and stop time as you work or enter time entries manually. And with access to these tools from your mobile device, you can edit a project while sitting on the bus or update the payment status on your invoices while in line at the store. Keep your data up to date and online with a free ZipBooks account. 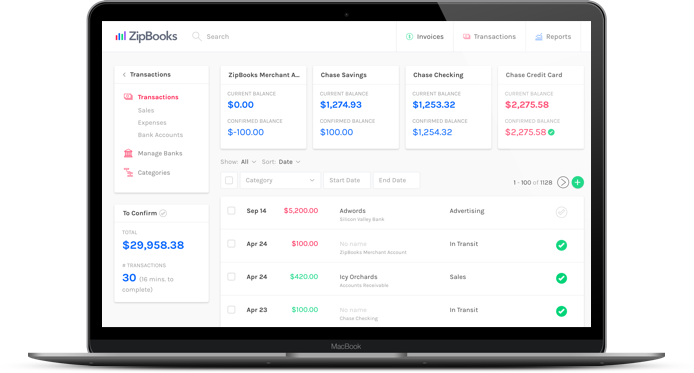 ZipBooks lets you create and send beautiful invoices. Automate everything with recurring auto-bills while ZipBooks seamlessly integrates your billing into your books. Manage your business on the go. 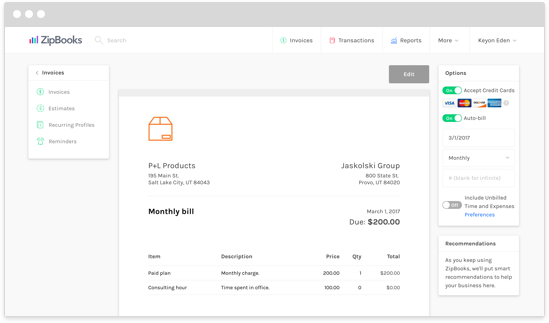 Send invoices, mark payments, store receipts, and categorize expenses with native mobile applications. Simplify your work by collaborating with employees, contractors, accountants, or other team members. 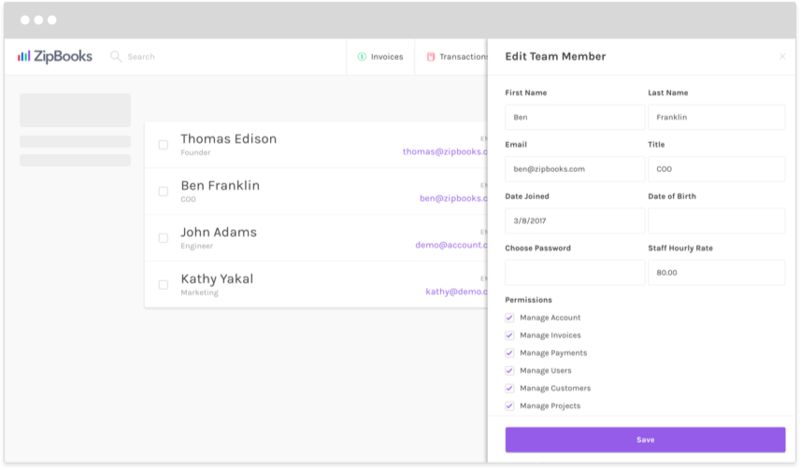 Manage team permissions on reports, invoicing and billing, time tracking, or other parts of ZipBooks. Organize your work into projects and tasks, and track your time right in the ZipBooks app. 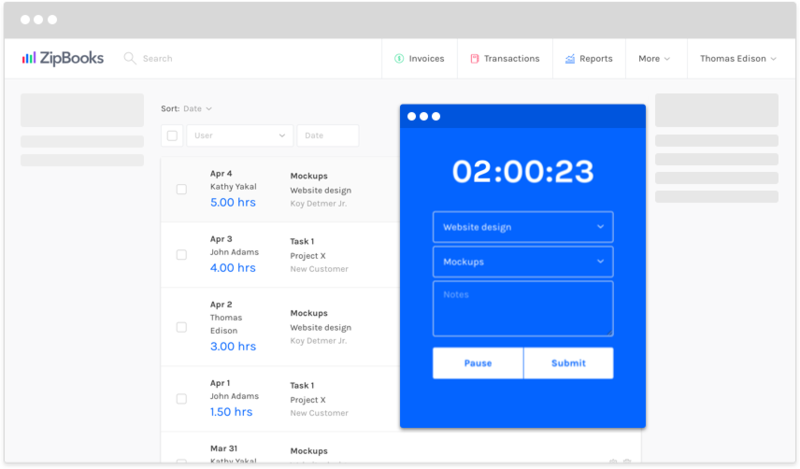 Once you’re ready to bill, pull that time into an invoice with a single click. 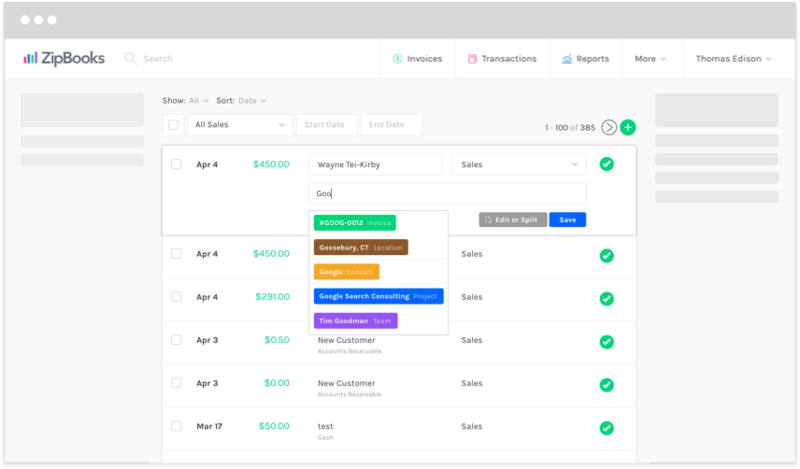 Tag a customer, vendor, project, or location in any transaction in ZipBooks and generate an income statement and other reports based on one or more of your tags. When you move your data to the cloud, you secure it from physical theft, loss, and hard drive failure. And once you're signed up, we'll protect your data with 256-bit SSL encryption. When your records are organized and accurate, your clients will be more likely to pay quickly. If they can look at their invoice and understand just what they're being billed for, they won't mind paying you right then and there. ZipBooks allows you access to all of our starter features without paying a single monthly or hidden fee. Our goal is to get you paid faster—this free accounting software is truly free.